Standalone mono mic preamp and eq module. 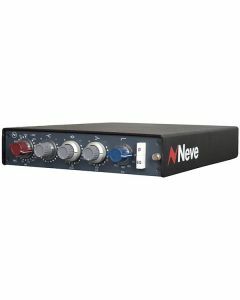 Launched in 1970, the Neve 1073 Classic soon became the first choice mic preamp for leading producers and artists. Found on some of the most famous recordings of the past 40 years, the big, punchy sound of the 1073 complements any musical genre – from rock to rap to classical. The quality is legendary. Planned and manufactured in England the modern-day Neve 1073N is built to the exact specifications of the innovative original – directly matching components to ensure the sound remains genuine and exact. The aggressive and impactful audio of the Neve 1073N fits into any genre superbly - its beautiful sound with the timeless Neve signature makes it the preeminent mic pre for recording all kinds of guitars, vocals and acoustic instruments. The top-of-the-range Class A design 1073N microphone preamplifier has 3-band EQ (fixed HF plus two switchable bands with cut/boost capability) and a high pass filter. Warmth and depth is added to recordings by the Neve 1073N’s mic pre and EQ combination, while magnifying subtleties in the ambience, maintaining spatial positioning and capturing a more accurate image – personifying the essence of the Neve sound in the eyes of many engineers and producers. The magic is in the detail of the Neve 1073N, down to its transformers which are hand-wound. It can be used as a standalone module or inserted into a compatible rack or console and provides the legendary Neve sound exactly as it was intended. Microphone Input: Input impedance 300 or 1200, gain +80db to +20dB in 5dB steps. Line Input: Input impedance 10,000 bridging, gain +20dB to -10dB in 5dB steps. Both inputs are transformer balanced and earth free. Maximum output is >+26dBu into 600. Output impedance is 75 @1kHz. Output is transformer balanced and earth free. Distortion: Not more than 0.07% from 50Hz to 10kHz at +20dBu output (80kHz bandwidth) into 600. Freq Response: +/-0.5dB 20Hz to 20kHz, -3dB at 40kHz. EQ Out. Noise: Not more than -83dBu at all Line gain settings EQ In/Out (22Hz to 22kHz bandwidth). High Frequency: Smooth +/-16dB fixed frequency shelving at 12kHz. Low Frequency: Smooth +/-16dB shelving with selectable frequencies of 35Hz, 60Hz, 10Hz & 220Hz. Mid Frequency: Smooth +/-18dB peaking, fixed 'Q' with selectable centre frequencies of 0.36kHz, 0.7kHz, 1.6kHz, 3.2kHz, 4.8kHz & 7.2kHz. High Pass Filter: 18dB per octave slope, switchable between 50Hz, 80Hz, 160Hz & 300Hz. Phase Button: Gives 180° Phase change at Balanced Output.